Gavin Barney is an Oakland, California native and a dedicated advocate for workers and injured people. He attended U.C. Berkeley School of Law, where he earned a J.D. and was included in the school’s Public Interest and Pro Bono Graduation in 2016. While a student, Gavin was an executive editor of the Berkeley Journal of Employment and Labor Law (BJELL), and a student director for the Workers Rights Disability Law Clinic, where he helped provide free legal services to low income workers with disabilities or serious injuries. 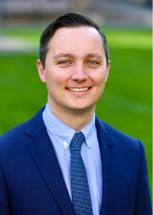 After law school, Gavin moved to Portland, Oregon, where he practiced in plaintiff-side employment law – including at the Northwest Workers’ Justice Project – for a little over a year. He moved back to his home town in 2018 to join Hildebrand, McLeod & Nelson. There Gavin will continue to represent and work to bring justice to injured railroad workers and others in Oregon, Washington, California, and the western states.